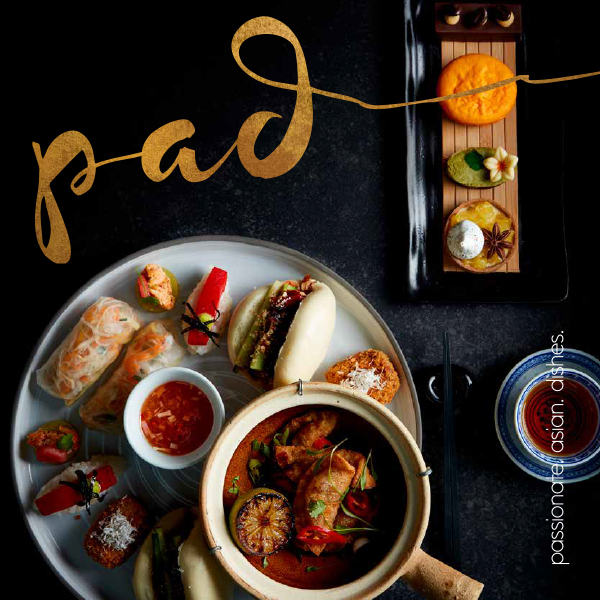 Offering a deliciously different dining concept, Pad serves up an exciting menu of fresh, contemporary Asian cuisine. From delicious fluffy steamed bao buns filled with hoi sin duck or pork belly; to succulent sharing platters of Peking duck and Korean fried chicken, savour this sociable dining experience bursting with authentic pan-Asian flavours. Food was lovely although I’m not sure about their chicken Thai curry. Desert was amazing. Thank you for looking after us. Good food, good service. We ate at 6:30pm which meant the restaurant was quiet so not sure how the atmosphere would have been later on when busier. What a truly wonderful dining experience. Attentive staff, delicious food washed down with wonderful Indian wine. Lovely food, good service and had a great meal. Thanks! The food is so good! Thoroughly enjoyed the Thai green curry. Staff were lovely as well! 10/10 would recommend. Automatic addition of a 10% service charge is not so good - does it go 100% to staff? Could have been a little tastier. Food was delicious and the staff were very helpful and welcoming. We had a lovely evening. Korean Fried Chicken Bao to die for, Singapore Noodles full of flavour and Lemon Meringue Cheesecake refreshing to finish! Faultless. Quite expensive but in fairness the food was exquisite and not had a meal out like it for a while! Not happy about putting the optional service charge. Didn’t feel comfortable having to ask the waitress to take it off the bill. Thank you for providing your feedback, this is a standard at the resort in all of the restaurants and is explained when presented the bill as optional. They food was lovely. Tasted beautiful. Staff very friendly and polite. Nothing was to much terrible . Atmosphere very relaxed. The service was fantastic. It made the evening relaxed and enjoyable. Absolutely brilliant experience! Fantastic food, superb service and so professional in all they did!! Highly recommend! The menu. Fab experience thank you! Wow! I booked to stay at Celtic Manor for my partner’s birthday and originally booked at Cen restaurant. Since the hotel has revamped and renamed the restaurant to Pad. I have to say I cannot fault the place. The food was outstanding and the service was exceptional. I would have no reservation in booking again. We dined at Pad on our anniversary. The food was very delicious and elegantly presented. Warm and attentive service. Myself and my husband were very impressed with the food&service.However this is the 2nd time we have been here&both times we felt it was too cold,uncomfortably cold unfortunately.I would say this is the thing that lets the restaurant down.